After making the 2 day journey by truck to Colorado, the real work begins after we arrive. 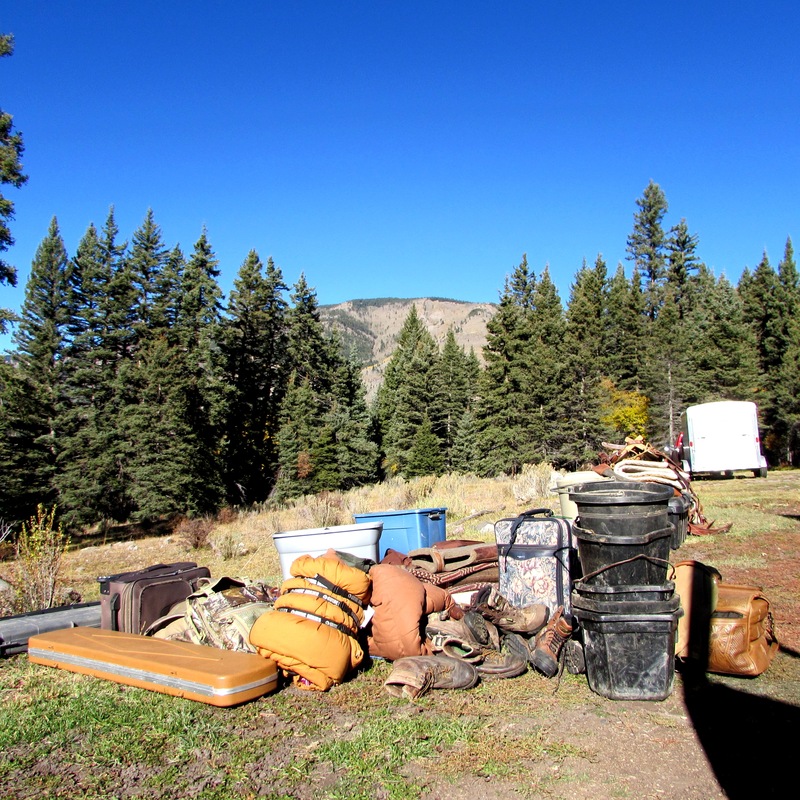 Packing in is a huge process that requires the same amount of care and consideration no matter if you are going 2 miles or 20 miles. The packs must all be weighed and even, they must be secure and tight and everyone must be on the same wave-length. You can’t just run to the hospital if something happens, you gotta be careful. So we are careful and Rob manages to get us all in and out of the wilderness each year safely, no small feat. Here you see a small fraction of the gear going in…. 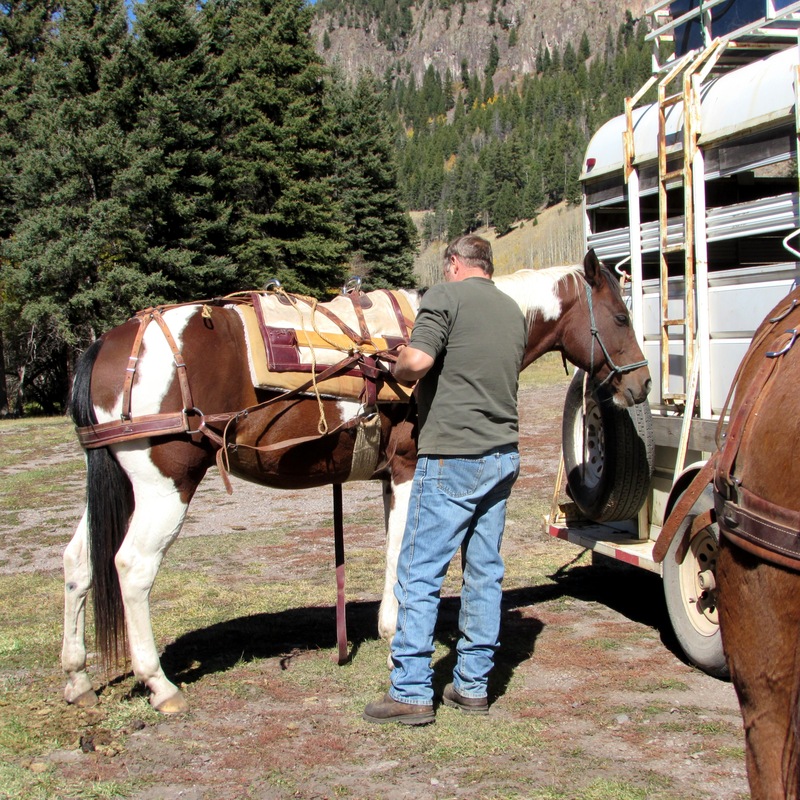 Pack saddles are MUCH different than riding saddles. There are two main kinds, Decker (pictured here on Max) and Saw Bucks, which you will see later. The Decker has hard packs or panniers that hook onto the metal rings, one for each side. Anything you don’t need to get squished or broken goes in the hard panniers. The other style, the saw buck, has soft panniers. While they are flexible and hold more they don’t offer much protection against bumps. 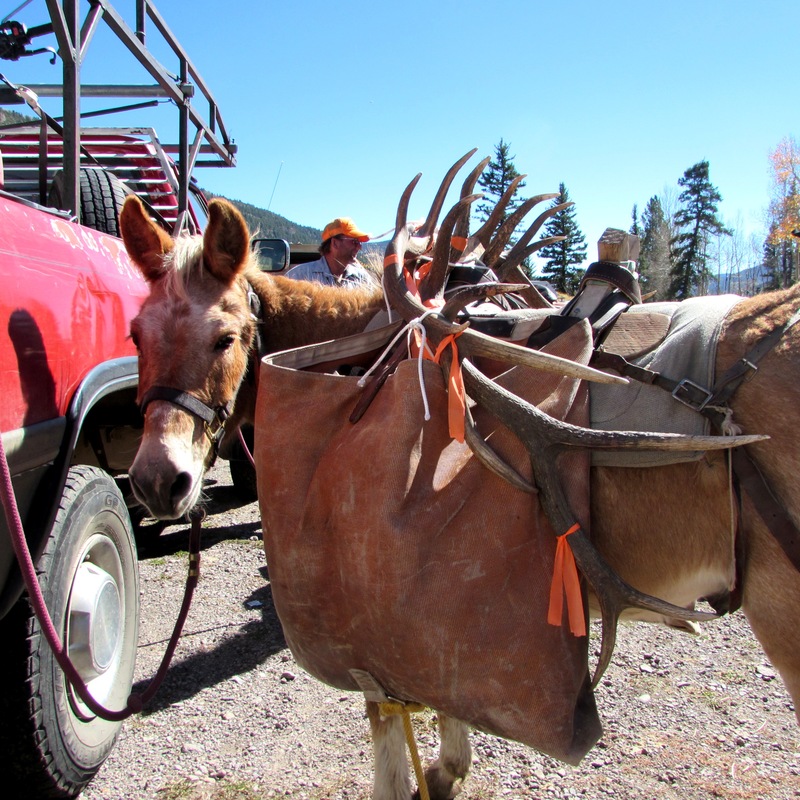 The soft panniers are also what we use to haul out the elk meat. This little guy just packed out 2 sets of horns plus some meat for his owner and the owner’s father. 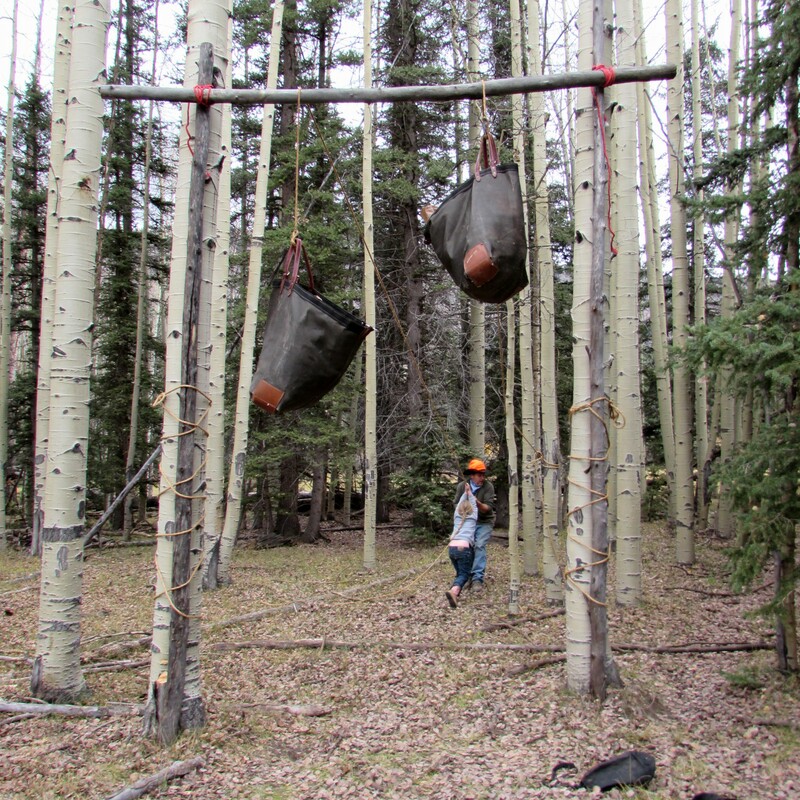 A real life example of soft panniers and a Saw Buck put to good use! Of course we had to visit a few minutes and you know the coolest part? This man’s dad shot one of the two elk and he is 78 years old! I hope I’m still in that good of shape at 78! 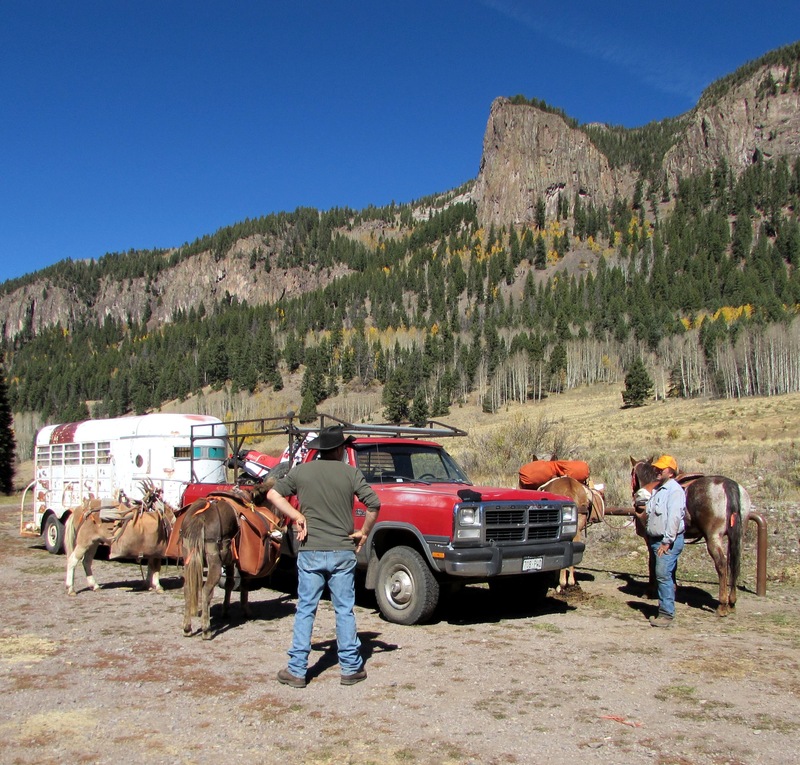 While they talked elk I took a few photos around the trail head…. We finally made it in with a load and began setting up camp! Getting the tent set up is always a bit tedious but we always manage to get it done. This is the big tent, a 16 x 20. We also have a smaller one but didn’t set it up this year. 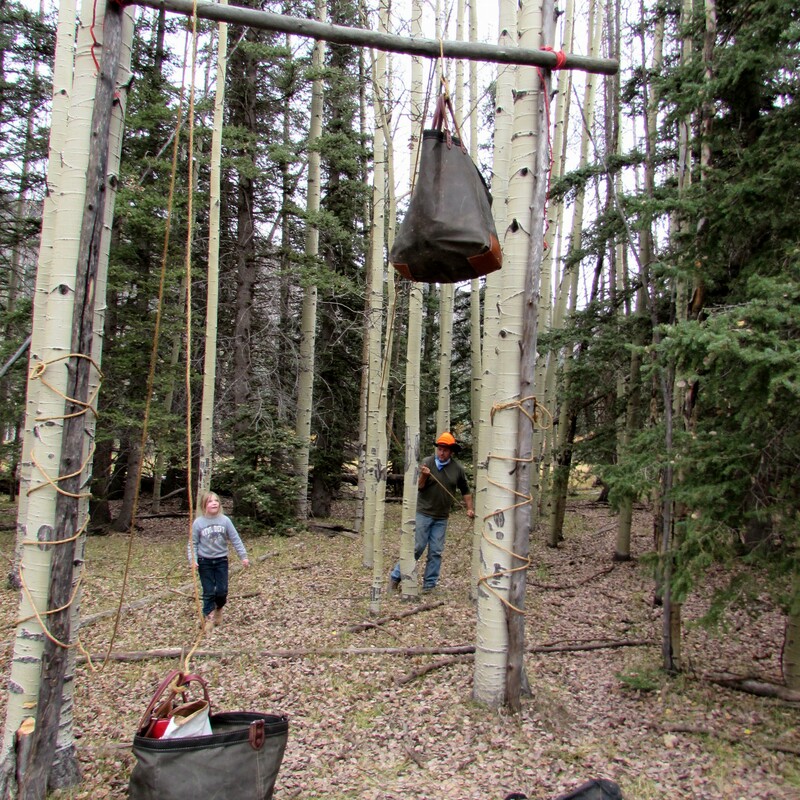 We also have to hang up all the horse food and people food in trees, at least 10 feet high, because of the bears. Last year we had a black bear visit our tent and he left a big paw print and an even bigger hole. We don’t like bears. The soft panniers are perfect for this task. Addie insisted on helping hoist the food! We spent the rest of the day putting cots together, watching Tater wander around camp and enjoying a ‘live’ armadillo show. He sang, danced and attempted to bite people. I’m quite certain this was the first ever ‘live’ armadillo show in the South San Juan. 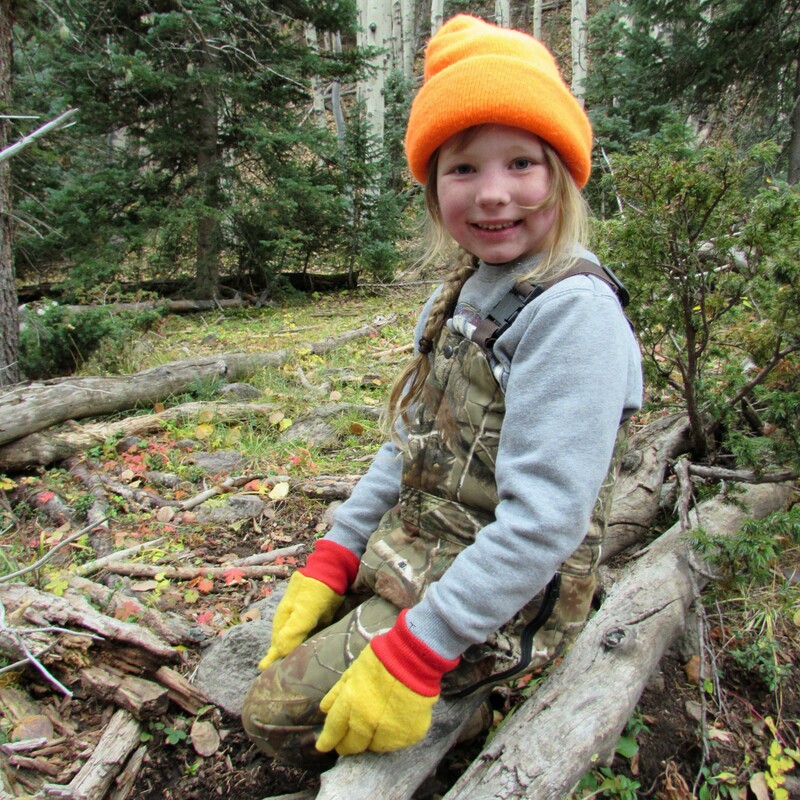 Opening day Addie and I hunted together not very far from camp, not only did we smell the elk (if you get close to them they have a very distinct, musky smell) we saw lots of elk sign and even got to watch the herd run up a hill and away from us. Oh well, she was a trooper and by far the cutest hunting partner I’ve ever had! However that evening, the lady who came with us went and sat over the meadow where Addie and I saw the elk that morning. This was only a 5 minute walk from camp, Addie and I tried to go hunting but sitting still for more than 15 minutes with a 6-year old doesn’t turn out very well. We were back in camp well before dark. About an hour after we returned Addie and I heard 3 shots and when we made it across the river this is what we found…. 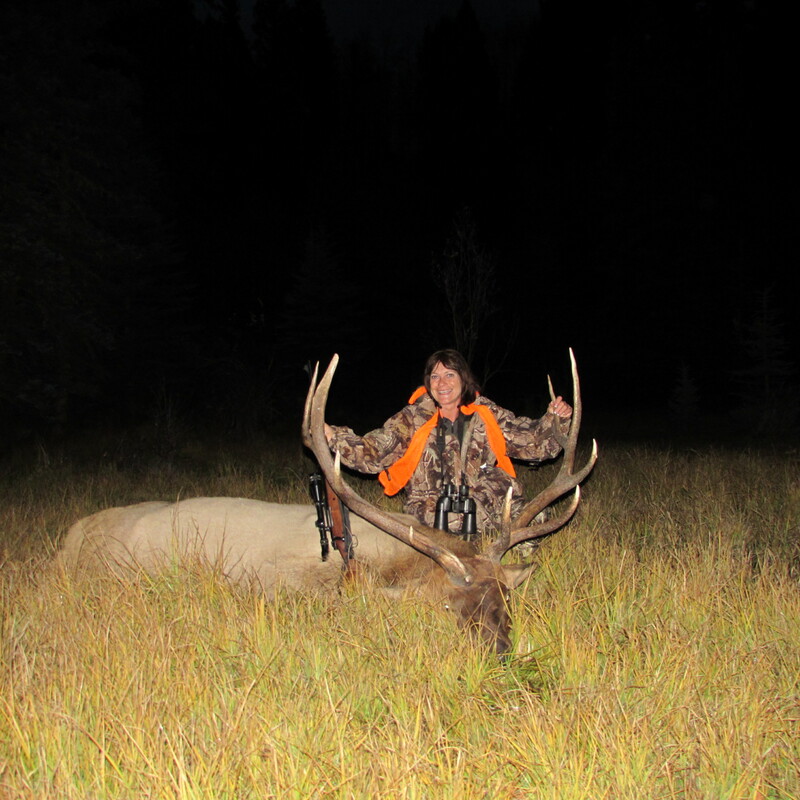 Patty and the biggest bull we have ever seen in 10 years of hunting. Rob had ridden out to go fetch Gus (his 14 year old son) from the airport. 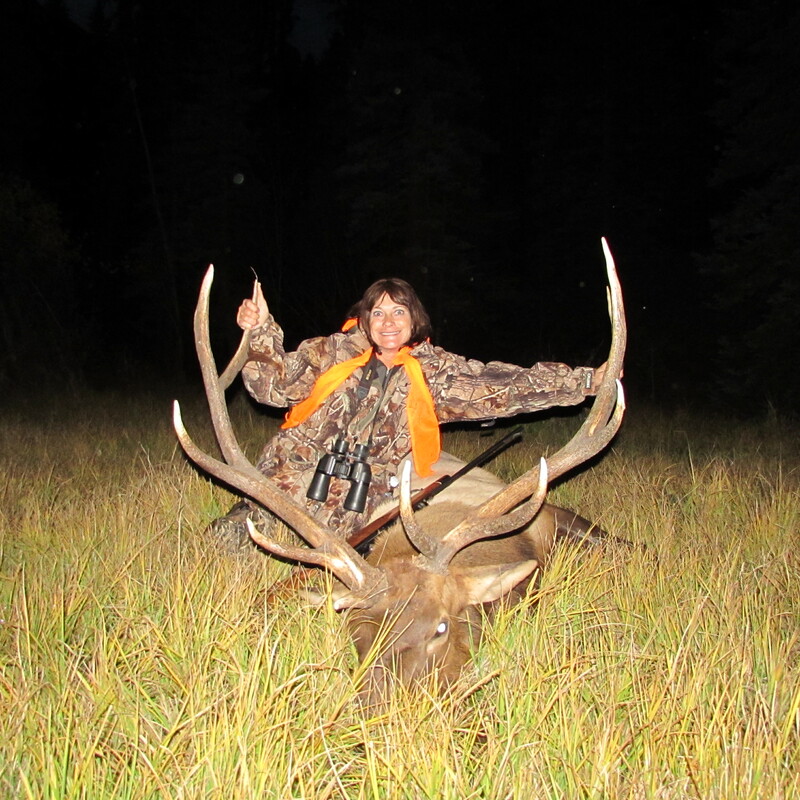 They got back to camp just before dark and just in time to help start getting Mr. Bull Elk processed. That is when the ‘real fun’ began……. Sounds like a busy trip!